Finely cast in good-quality dark green alloy, this axe head is decorated in shallow relief on both sides. The stylised animal, fish and bird motifs are typical of the Dong Son decorative repertoire. On one side along the edges the stylised shapes of two confronting crocodiles frame a squid motif (at the top) and two long beaked aquatic birds standing in a fish-filled pond (bottom). The other side depicts two confronting dragon-like animals above two humped bulls and a man. 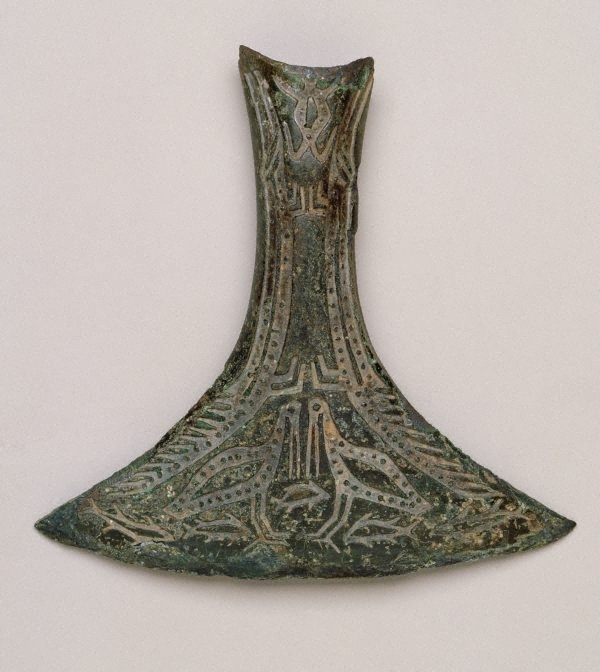 While similarly shaped battle axes have been found throughout maritime Southeast Asia, the quality and elaborate decoration on this piece indicate it was a ritual object, probably part of the grave goods of a community leader.